Not to be outdone by, even Joseph Smith! Peggy Fletcher Stack: President Nelson, you're already President of the Church, isn't that enough for you? President Nelson: Well, Sister Stack, "My calling and election was made sure when I became an apostle so the Lord impressed upon my mind that election meant the U.S.Presidential Election. Stack: So you prophesy a victory in 2020? Nelson: To think otherwise is subjecting yourself to Satan's influence. Stack: You will be known as "The Mormon Candidate." Nelson: No Peggy! 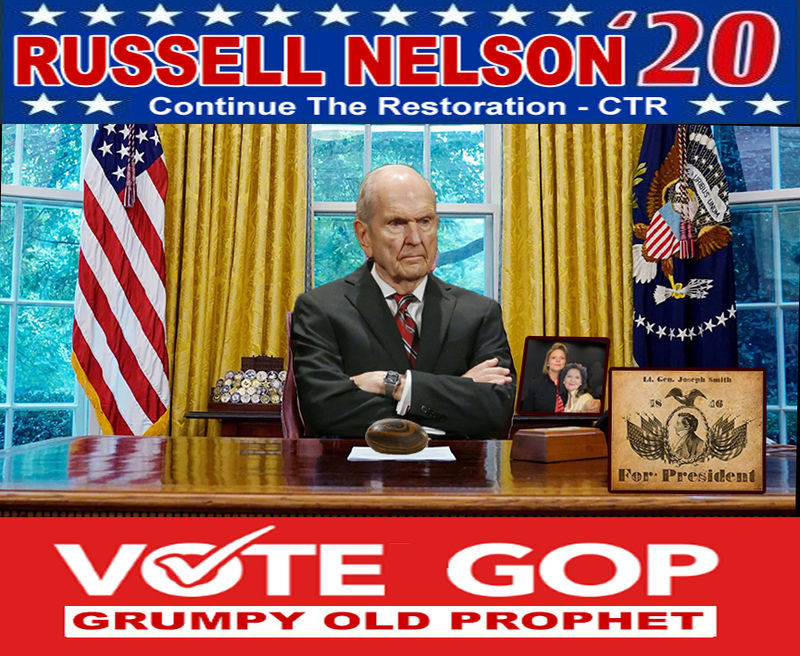 I demand to be known as The Church of Jesus Christ of Latter-day Saints Candidate, even Russell M Nelson. It's catchy and has a certain heavenly ring to it. Stack: Departs mumbling to herself. Edited 1 time(s). Last edit at 11/07/2018 03:59AM by cricket. Nelson president of less than 16 million, POTUS is president of 330 million, or about 45% of those. Make Mormonism Great Again! Wait..make Church of Jesus Christ great again? Make The Restoration great again? Campaign slogan: You'll have your agency - free as long as you obey ME!